BlogHome » Blog » Eating Disorders » Share Your Eating Disorder Secret – It Helps! If you’re living with the secret of anorexia or bulimia, please understand your eating disorder behaviors thrive on your shame. The more you isolate yourself, the more you keep it a secret, the more it leads to suffering. If you haven’t heard of Brene Brown, a shame researcher (you’ll learn more about what that is shortly), you may find her popping up all over the place soon. That’s what happened to me. I first saw her Ted.com talk in December of 2012 and I loved it. She’s a wonderful story teller and has an uncanny ability to whittle down complicated information into real-world speak. The woman has a gift. She’s funny and light-hearted about a very touchy subject – shame. And vulnerability. I’ll let her do the talking, but the biggest ah ha for me was the fact that when we allow ourselves to be vulnerable, to share and open up with another person about something we fear and they give us empathy in return, we feel love and connection. I’d say one of the things you give up in a big way when you have bulimia is love and connection. It is impossible to feel a deep connection and love with someone when you’re keeping a part of you from them. It’s amazing how Brene says that the act of opening ourselves up, to be vulnerable and let someone see us – the true me inside – we don’t feel so alone. We don’t feel so isolated and like the only person in the world with this problem. What I want to share with you first is Brene’s recent appearance on Oprahs’s Super Soul Sunday show. Fantastic talk. This is just one segment of the larger talk. I also want to share more from Brene with you in case you’re catching Brene fever like me. I’m sort of stalking the web looking for clips or articles she’s written to better and better understand this animal called shame. I find that the more I learn about shame the better I understand why I had bulimia for 20 years. It’s fascinating how intertwined they are. As of today Brene has done two Ted.com talks. This is the first one and my favorite. She reveals her findings about vulnerability and what being vulnerable gives us access to. Another awesome Ted.com talk is Brene’s presentation about shame. This is more of the material she talks about on Oprah, so it may be a little overlap, but it’s all good. I love her message and the insights her research has made possible are just down right AWESOME! Bless her for having the courage to (a) research a topic like shame, (b) to go around the world and tell people about it and (c) to have the passion and determination to spread the message and allow what she’s learned help others in the process. There’s so much wonderful wisdom in these videos. I hope you’ve learned something about yourself and may now realize how sharing yourself will serve you. It may scare the crap out of you. But being vulnerable and receiving empathy from a friend or loved one will create way more love and connection than any amount of food can give you. So, will you try it? I invite you to share your secret with one person this week. Choose carefully, but be brave and vulnerable and watch what opens up for you. If you’d like to share about your story or a little about yourself below, please do. It could help. 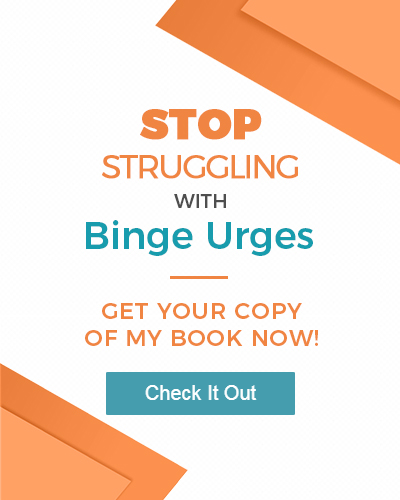 “Brain Over Binge” Book Review – I Recommend!